I started reading this series of books in Middle School. The author calls them science fiction, but really I think they have a lot more in common with fantasy - it takes place on a world colonized by earth, but that lost contact thousands of years before. Without modern technology, an agrarian society with the apprentice system is set up. Dragons are basically indigenous creatures that people team with to protect from a sort of deadly rain that comes around every 200 years... Sounds strange huh? They're fun books though. 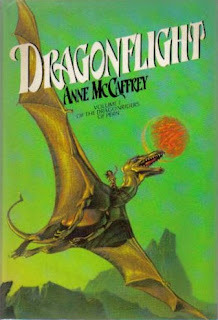 Anne McCaffery was the first woman to win the Hugo award because of this series of books, the Dragonriders of Pern. I enjoy the theme of rediscovering as the characters unearth more history and background - something that always makes books more interesting to me. The characters are fun and well written, and the dragons are dang cool. You can't help but want your own. I think part of my fascination with dragons comes from these books, and they're the standard against which I hold dragons in most other fiction. Christopher Paolini appears to have been highly influenced by the dragons in these books, for example. The audiobook is good - Average production quality, no silly special effects or anything. As far as rating where children are concerned, again, probably PG-13, though not as much as Treason, the last book I reviewed.